I had a craving for Chicken Fried Rice so I cooked a pot of rice Friday morning before going to work. And I thinly sliced up a couple of boneless chicken breasts while they were still frozen. Easier to slice thin that way. When I got home from work it was a simple dinner to put together. Marinated the chicken with a little Shao Hsing, cornstarch, sesame oil, and just a teaspoon of soy, for about 20 minutes. Heated the wok and cooked the egg. 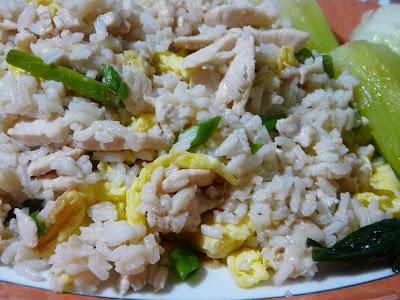 Then the chicken, added the rice and tossed until hot, in went the egg and the green onion and it was ready to eat. We had braised Shanghai Bok Choy with garlic and oyster sauce on the side. Last night was roasted potatoes with grilled Baby Back Ribs seasoned Greek style. My favourite way to do ribs. Depending on the size of the ribs they take between 45 minutes and an hour on a hot grill over indirect heat. will change the texture of the meat. occasionally until ribs are tender. 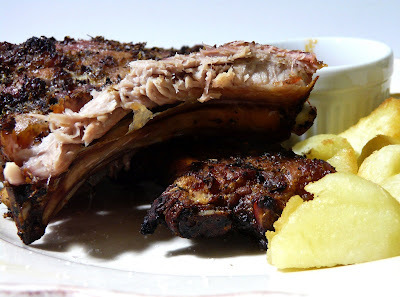 of the ribs but could take longer depending on grill being used. Everything looks delicious, Ann. The ribs look so tender and mouthwatering. Yum! I was very busy this weekend and am settling down for a good browse..Your ribs look like they're falling off the bone..Love that! Oh my...all looks just wonderful! wondering about cooking time in oven then finish on the grill ?